Stade Louis II, Monte Carlo, France. An electric atmosphere filled the whole of Monte Carlo, Arsenal had to win by three or more to progress to the next round and Monaco got the game underway, Arsenal had the ball from an interception. Berbatov was put in and it was offside, Berbatov then ended up with the ball, layed off Moutinho, he missed. Giroud and Abdenour got into a battle, the Monaco player went down. Martial, Karzawa and Moutinho were breaking through Arsenal early on. Moutinho took a free kick and Ospina was gifted and saved the ball. Arsenal were playing passes to the opposition, Wenger didn't like this. Arsenal were playing their famous passing game and played well down the right, what could Arsenal do from this? They still had the ball and Monaco ran and ran until Bellerin was on the right, Giroud just headed wide from the 6 yard box. Welbeck stretched his legs down the left but the ball went out and Monaco crashed forward. Özil was on the left, he crossed in and Cazorla didn't connect with his acrobatic effort. Cazorla sent in a cross from the free kick, Karzawa headed backwards and Koscielny hit the bar from 5 yards, offside anyway. Arsenal had a good ten minute spell, Sanchez got yellow for a challenge on Kondogbia. Potential was shown with Bellerin and Alexis down the right. Alexis, Cazorla played well and the ball didn't get to Welbeck. Giroud scored! Arsenal had hope, two more goals were needed when Giroud smashed the ball into the roof of the net. The Gunners took the lead. Welbeck struck a shot, it unfortunately deflected out of play. Alexis got put under pressure, the referee gave a yellow to Sanchez. Danny Welbeck set up Giroud, straight to the keeper. Half time and Arsenal got a goal that they needed and if they can hold on. Bellerin sent in a cross and Koscielny missed the ball and hit the Monaco keeper. Arsenal passed well and Özil was in a good position to score a free kick. 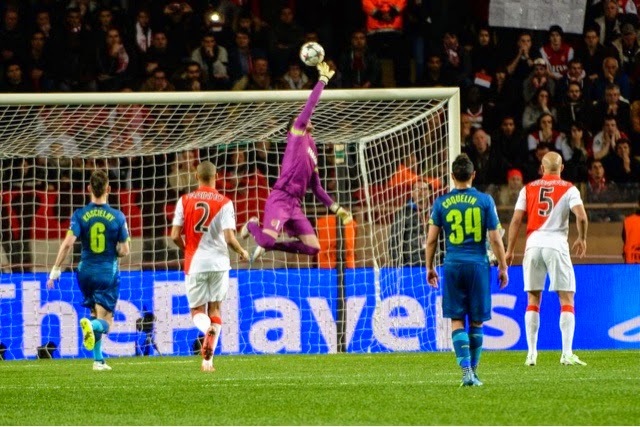 Subasic saved. Martial finally made way for Fereira-Carrasco. Aaron Ramsey was ready to come on, could he score as he replaced Francis Coquelin. Berbatov made way for Bernardo Silva. Arsenal took their chances and more were on the Horizon when Welbeck swiftly went off for Walcott. Aaron Ramsey scores and Arsenal were level on Aggregate and one away from winning. Sanchez got clipped by a Monaco defender. Monreal hit the bench as Gibbs came on for the Gunners. Özil sent a free kick in and the ball was crawled off the line. The final whistle was blown as Arsenal were a goal off and the confetti fills Monte Carlo and Arsenal are out and Monaco are through. Arsenal sent crashing out of the Champions League at the hands of Monaco despite a win.